Перед началом полета бортпроводник должен объяснить/показать пассажирам, как пользоваться аварийно-спасательным оборудованием, и какие правила безопасности необходимо соблюдать. Прочтите с выражением (постарайтесь использовать все свое мастерство и артистизм) инструкции, приведенные ниже. Время проявить ваш талант! Please put on your seat belt. Just insert the metal end into the buckle until it clicks, and pull the loose end to tighten. To open, lift on the top of the buckle. 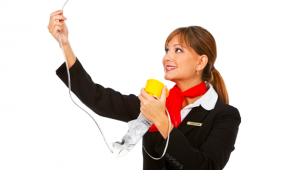 To use the oxygen mask, pull on the mask down on your face and cover your nose and mouth. Lift the elastic band around your hear and tighten by pulling the loose ends each side of the mask. Then, just breathe normally. Welcome to ……. Airlines. Please note that smoking is prohibited on this plane. And that all restrooms are equipped with smoke detectors. Please be advised that portable electronic devices should be turned off during take-off and landing. Cellular phones should remain switched off throughout the flight. There are 8 emergency exits on this aircraft. 4 on the left and 4 on the right. Please take a moment to locate the exits nearest to you and remember, these may be behind you. This entry was posted in английский для бортпроводников and tagged buckle, exit, loose, mask, plane, pull, smoke, tighten.